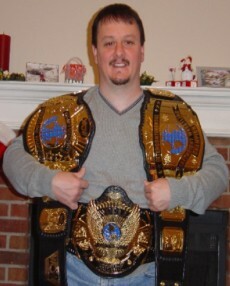 Here are pictures of my World Championship Wrestling United States title. It sports the WOW logo which is close enough to the WCW logo for me. Dave did a incredible job on this one, the leather cut and tooling are just perfect! It's a 5 plater with logo plate and tip.